Allen & Tetley wandered in to find Shaun with Little Eric sitting on his back, pouring over one of the Wainwright Guides. "What are you doing", asked Tetley. "Well, I overheard Dad talking on the phone to Uncle Eric, and they have arranged a walk for tomorrow. 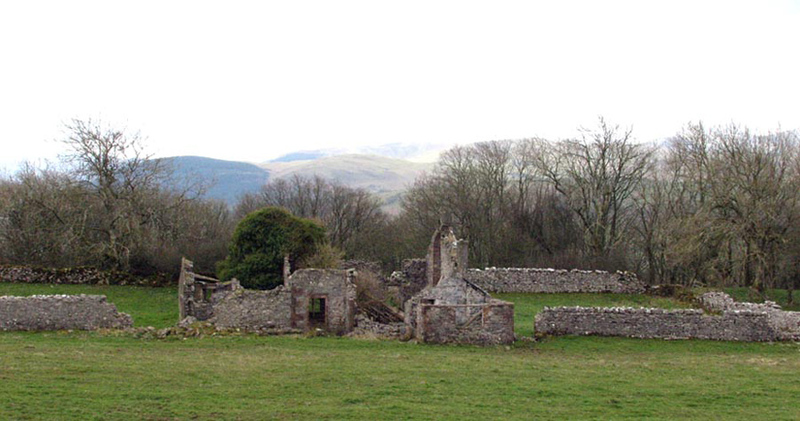 We are to do some of those Outlying Fells that we have long wanted to do in the Cockermouth area, so I thought I would read the appropriate chapters." "Which ones are we doing", asked Allen. "Watch Hill, Setmurthy Common and then Clints Crags", replied Shaun. "I have looked for those first two when we have driven along the A66, but have never been able to spot them", said Allen. 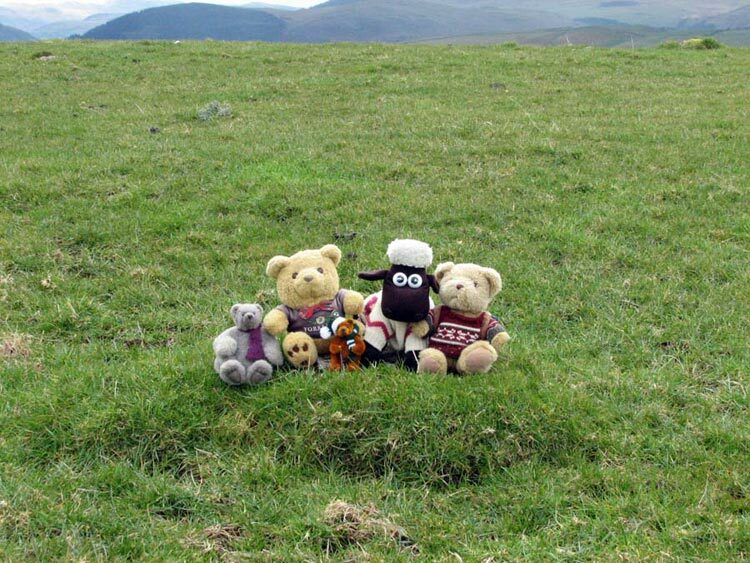 "Well", said Tetley knowingly, "that is because the majority of the A66 between Keswick & Cockermouth, is now on the track bed of the railway line that once ran all the way from Penrith to the west coast. The hills are above the old road, which we will have to use tomorrow." "That will add extra interest before we start, then", said Allen, glad of the clarification. Apart from a short hail shower it was a dry day if rather cold in the wind. Along the familiar A66 we passed under the towering slopes of Blencathra. Then passing Keswick, we continued along beside Bassenthwaite Lake, before the road swung west towards Cockermouth. The level and straight nature of this stretch made it plain that it had once been a railway line. Uncle Eric is a railway enthusiast, and we knew that he would prefer this to still be a railway. He pointed out a number of buildings, now private houses, that had once been associated with the railway. Leaving the A66 at Embleton we then followed what was the original main road, now a quiet byway, to its junction with Higham Lane, parking in a convenient layby. A few yards further along the road, brought us to the bridleway for our ascent (part of long distance path called the Allerdale Ramble). This crossed a number of fields and climbed steadily. The fields were full of ewes with their lambs, a lovely sight and the epitome of spring. Eventually the track turned more left, at which point we kept ahead, to soon reach the unmarked flat top of Watch Hill. 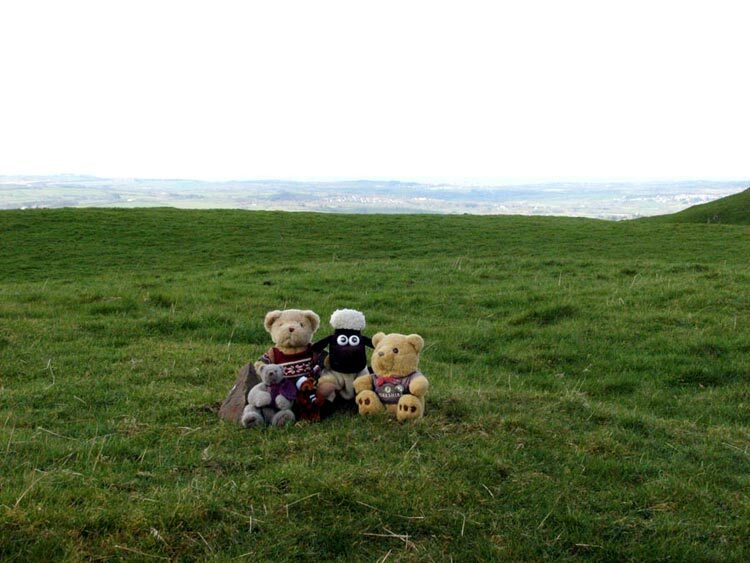 The grass was rather wet, so Dad kindly sat us on his map case, while he took our picture. In the corner formed by the trees, the tops of which can be seen, is the summit of Setmurthy Common, our next objective. 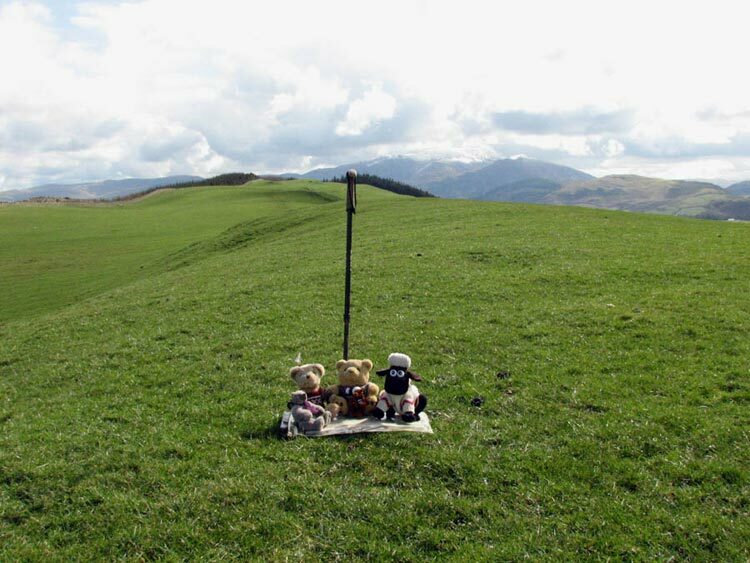 However progress towards this was delayed as we just looked in awe at the wonderful prospect of the Lakeland Fells, many of whose tops we had visited. 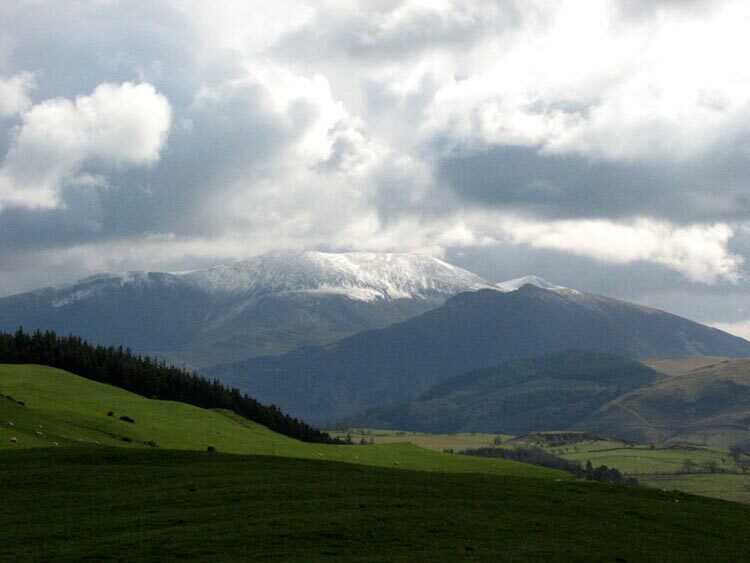 The closest were Skiddaw and its associated fells, dramatic under a covering of snow. "Wow, what a view" cried Little Eric. He only joined the club last March and this was only his second walk in Lakeland. "You must take a picture Dad." 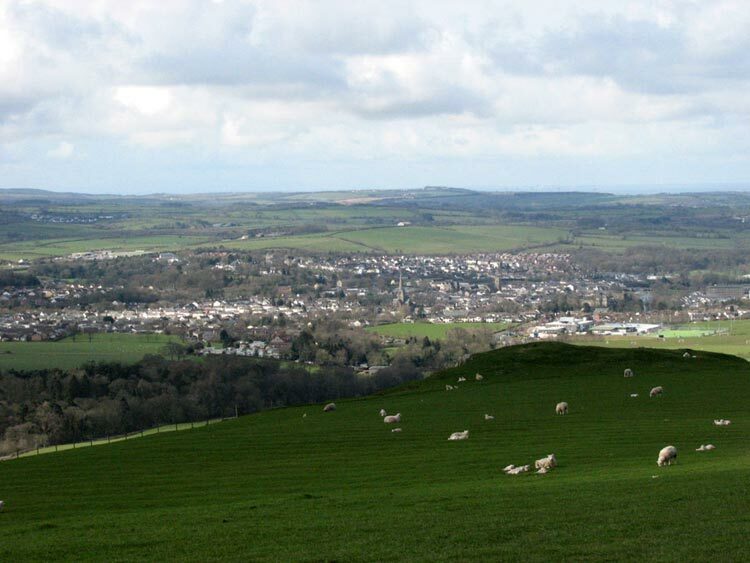 To the north was the Solway Firth and Scottish hills, and nearer, Cockermouth was laid out before us. Find out more about Cockermouth in Elmer's story of the holiday to Armathwaite Hall. We were privileged to able to see these views for most of the day. Walking on we descended slightly before crossing over undulating ground to the corner bounded by woodland. Here three stones marked the top of Setmurthy Common our highest point today. Beyond the end of the Skiddaw group, we could see the clouds swirling over snow covered Red Pike and the ridge to its left rising to High Stile. 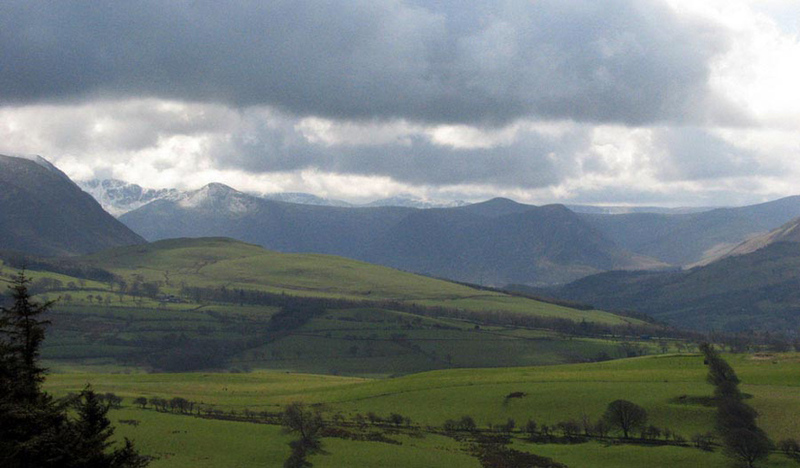 To the right is the pointed top of Starling Dodd, seen between Mellbreak. There is not any way to make this a circular walk, so our outward route was followed, with the superb views before us to return to the car. To ascend Clints Crags we needed to start from the village of Blindcrake, which is off the main A595 road from Cockermouth, which for stretches follows the line of a Roman Road. 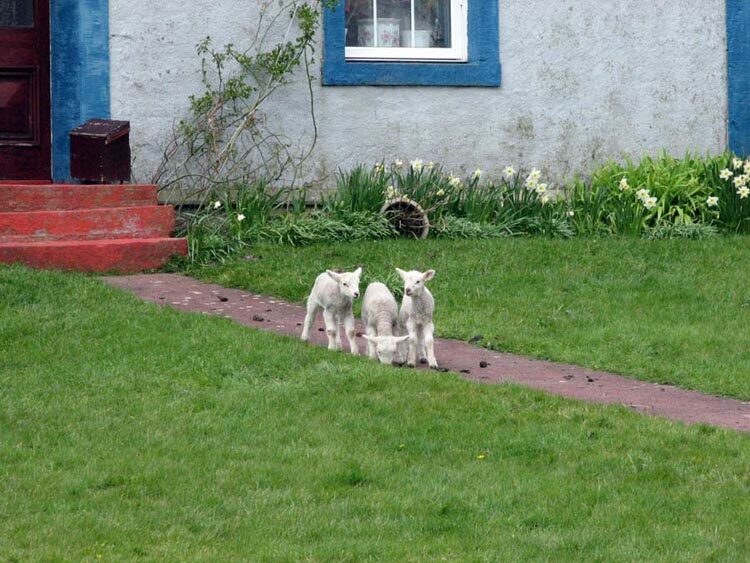 Walking to the end of the village we passed Allison House Farm, where these three lambs were playing on the garden. Across the road was a path signed to the small hamlet of Sunderland, which we took (Uncle Eric and Dad engaged in much banter about the Stadium of Light etc etc!!). [In NE England is the large town of Sunderland whose football team play at the Stadium of Light]. It was a muddy track that eventually reached the open fell through a gate, from where it was just a short walk to the highest point of Clints Crags. Again a flat top, the summit being unmarked. 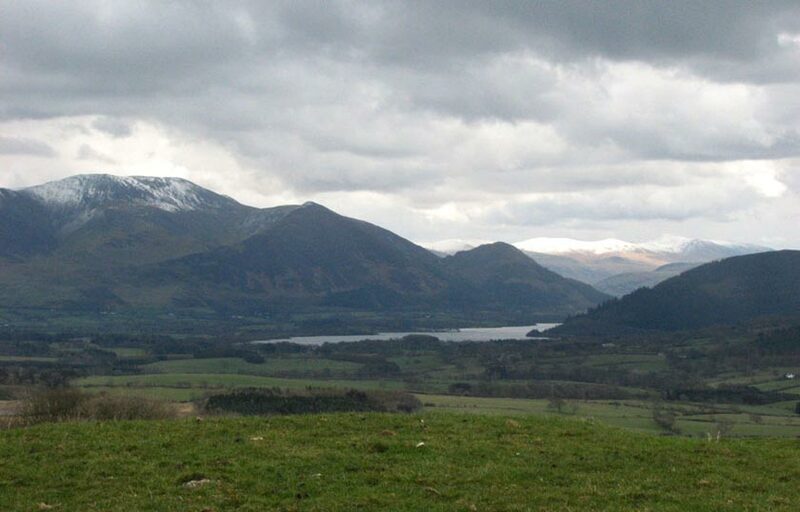 Despite the modest elevation, there were dramatic views of Skiddaw, Bassenthwaite Lake, and behind the snow covered skyline of the Lorton & Crummock mountains. After all the effort so far is was now time for lunch, and we sat out of the wind in a hollow below the summit (remains of a long disused quarry). The wonderful views were spread out before us, and again we realised what a lucky lot we are. Settled in the rucksack, we then continued on ahead passing the sad ruin of Thackray Cottage, and on along a walled track. At the end, rounding a corner on the right, at another gate, we doubled back to walk through parkland between plantations to reach Blindcrake. These had both been delightful walks, and it just goes to show that even from low altitude there can be superb views. Although much less strenuous than some of our adventures, these summits were an important step towards achieving our objective of climbing all the fells in Wainwright's Outlying Fells book.